The Katerina City Hotel is a modern business hotel conveniently located in the Moscow city center, just a few minutes' walk from Paveletskaya metro station and only 3 km away from the Red Square and the Kremlin. Modern European architecture and fresh interiors in Scandinavian style are combined at the hotel. Many Moscow historical sights and business centres are located within easy reach from the hotel. The Katerina City Hotel offers 120 rooms of various categories. All rooms are fitted with direct international telephone line, Wi-Fi Internet, mini-bar with a choice of beverages and snacks, satellite TV with a broad choice of programs, video on demand, self-regulated air-conditioning and heating, office desk with a lamp, hairdryer and mirror for make-up, bathrooms equipped with shower cabin and heated floors, electronic key card access system, fire-fighting system. Dining is available at the Stockholm Restaurant, offering room-service. The menu contains courses of Scandinavian, European and Russian cuisine. Besides serving guests, the venue does banquettes, cocktail receptions, anniversaries, corporate parties and catering. The hotel bars are also at the guests' disposal. Eight conference halls ranging in capacity up to 120 persons offer everything required for successful conferences, trainings, business meetings and negotiations. On the top of that, the Katerina City Hotel provides supplementary services - 24-hour front desk, fitness hall, sauna, safety deposit boxes, parking. 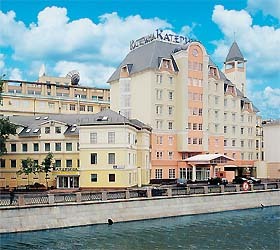 The hotel has 2 buildings - building №1 of the Katerina City Hotel has a category "three stars". Rooms in this building are decorated in more softed colors and have smaller area.